The architects were Satterlee & Boyd this could be the S*B. Quite so! Most likely. 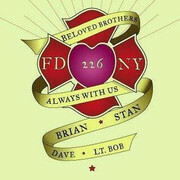 Instead of a fire company (289 and 139), it could have been the architects. Volunteer Engine 16 “Mt. 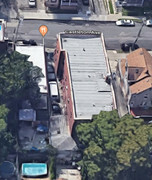 Prospect” was located at State Street and Nevins Street. 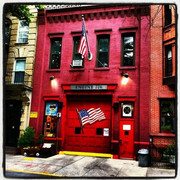 They reorganized as Engine 16 “Hibernia” in 1867 at 16 Cole Street. Engine 16 was disbanded in 1869.
and hotels, all the theatres in the vicinity of the City Hall, seven or eight public schools all the large retail dry goods stores and business places, several large churches and a number of flat-houses and factories. Included also in this territory are St Peter's Hospital, the Long Island College Hospital, St. Paul's Orphan Asylum, the Sheltering Arms Polytechnic Institute, Packer Institute, Boy's High School, and St. Francis Academy. Richardson's car stables. Pinto's grain elevator, the Brooklyn Sash and Blind Company's factory, and Smith, Gray & Company's building. The men who compose this company do not know the meaning of the word "fear." There are those among them who have not faltered for a moment when human life was in peril, and others still who carry the scars of injuries received while in discharge of duty. three-story brick dwelling No. 374 Bond Street. Jan. 22, 1884. 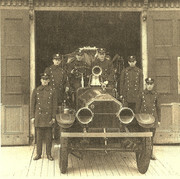 No 4 was the first engine due at the fire, and Mr. DOOLEY was sent in to open up the house. On the top floor he found two women who had succumbed to the smoke. Before the truck arrived, the brave fireman had carried both women down an iron ladder obtained from an adjoining factory, and landed them in a place of safety. He was almost overcome by the heat and smoke, and it was some hours after before he fully recovered from the effects. At seven o'clock in the morning of March 2, 1890, the " double-decker" flat-houses, Nos. 362 and 362 1/2 Atlantic Avenue, caught fire. When DOOLEY arrived on the scene with his company he saw Mary Powers, an aged woman, in a third-story window Just about to make a leap for life. He shouted to her that help was coming and then dashed up the stairway of the next house, clambered out on the window-ledge and stepped over to where the woman was. A ladder had been put up by this time, and down it DOOLEY, with the assistance of Fireman COPPINGER, carried the now half unconscious woman amid the cheers of hundreds assembled in the street. In the early morning hours of Aug. 31, 1890, fire broke out in the four-story double flat-house, No. 452 Atlantic Avenue. Foreman DOOLEY with other brave men worked their way up the narrow stairway as rapidly as possible, and when the last man came down the ladder he carried the fifteenth person whose life had been jeopardized by flame and smoke. Little Georgie TODD, two and one-half years old, was left alone in his parents apartments on the fourth floor of No. 94 Butler Street, Aug. 22. 1891. In some unaccountable manner a fire broke out, and when Foreman DOOLEY found the child he was lying near the stove unconscious and terribly burned. Tenderly he lifted the little sufferer and carried him down to the second floor, but while the Ambulance Surgeon was pouring oil over the little burned body, death put an end to the child's suffering. At the gas house fire on Hoyt Street, about eight years ago, the slate roof fell in and injured Mr. DOOLEY severely about the head. At Dyckman's box factory fire on Union Street, in, 1891, he was so overcome by the intense heat and smoke that he had to be removed to. St. Peter's Hospital. Assistant Foreman FRANK J. DUFFEY was born in Brooklyn, in Jan. 1856. From 1869 to 1876, he served as a shipsmith's apprentice in the Construction Department of the Brooklyn Navy Yard. He was appointed to the Fire Department July 7, 1880, and promoted to Assistant Foreman July 1, 1889. Mr. DUFFEY assisted in the rescue of several persons at the flat-house fire. No. 452 Atlantic Avenue, on August 31, 1890. Engineer JOHN H. HEATH was born at Navesink, Monmouth County, N. J., in 1855. 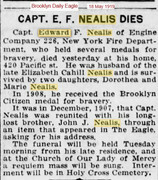 From 1875 to 1881 he served as a first-class fireman in the United States Navy. 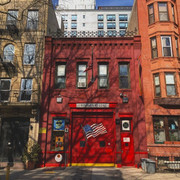 His connection with the Fire Department of Brooklyn, dates from April 2, 1885, and his promotion to engineer occurred on Feb. 9, 1891. WILLIAM L. MEYERS is a first-grade fireman. 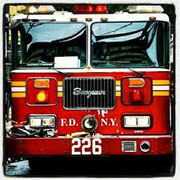 He was born in Brooklyn, in 1868, and became a fireman Dec. I, 1888. At the flat-house fire, No. 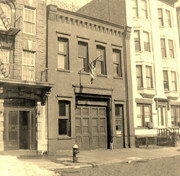 452 Atlantic Avenue, on Aug. 31, 1890, Mr. MEYERS aided materially in the rescue of Robert O'DONNELL, his wife, five children and sister-in-law. At another fire on the same night at No. 293 Livingston Street, he was brought out unconscious from a front room on the third floor. At the Dyckman box factory fire, Oct. 13, 1890, Mr. MEYERS was overcome by escaping gas while at work in the sawdust bin, and was removed to his home in an ambulance. 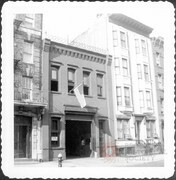 Bernard L. STORP was born in Brooklyn, in 1856, and became a fireman on Jan. 21, 1884. On May 5, 1885, he was severely injured about the head by falling bricks while working at a fire at Nos. 40-48 State Street. Both of his feet were so badly burned at the Planet Mills fire on April 12, 1889, that he was in the hands of Surgeon ROBBINS for many days thereafter. John F. WARD was born in Brooklyn, in Feb, 1861, and he first donned the uniform April 7, 1885. On July 4, 1890, he was overcome by smoke at No. 123 Schermerhorn Street while at work on the fourth story. 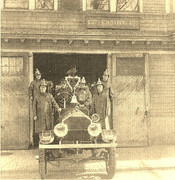 While returning from a fire at Box 54, on Jan. 19, 1892, Mr. WARD was thrown from the hose-wagon. The hind wheel of the wagon passed over his leg at the knee joint and crushed it so badly that it was feared amputation would be necessary. Hugh J. GALLAGHER is a native of Brooklyn, born in 1868. His appointment to the uniformed forces bears date Oct. 14, 1890, and he has been attached to Engine No. 26 since that time. On Nov. 4, 1891, while going to a fire at No. 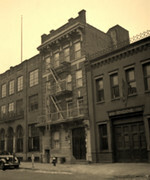 389 Degraw Street, he was thrown from the seat of the hose-wagon at State and Bond Streets and had one of his legs nearly torn off by coming in contact with at shed post. Martin J. MURPHY was born in Brooklyn, April, 1865, and has been a member of the company since he was appointed, on March 12, 1891. James DONOHUE was born in Ireland, in 1852, and made his debut as a fireman March 1, 1887, since which time he has served the Department creditably. John DWYER was also born in Ireland, and though he has just passed over the three-score mark is still young enough to perform good work. When he sits in the driver's seat the fire flies from the horses' heels. Edward J. FITZPATRICK was born in Brooklyn, July 18, 1869, and has been a faithful member of the Department since Nov. 16, 1891. Thomas F. O'CONNOR was born in Brooklyn, in Dec., 1864, and was appointed to the uniformed force on July 15, 1889. He was assigned to Engine No. 5, where he did good service up to Nov. 26, 1890, when he was transferred to this company. 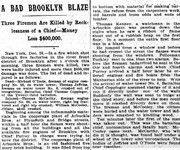 1902 Arbuckle Fire wall collapse killed 3 FDNY firefighters - Lt William Jeffrey, Engine 126 (later Engine 226) detailed to Water Tower 6 - December 26, 1902 - The Brooklyn Daily Eagle for Dec. 26, 1902, reported on a fire at Arbuckle Cooperage at 214 Plymouth Street which took the lives of three Brooklyn firefighters. The firemen were killed when a wall collapsed at the 50-year-old building that housed a sugar refinery and a “cooperage,” meaning a firm that made wooden barrels. The Eagle pointed out that a fire at that location was very dangerous, since the company was surrounded by a paint factory, machine shops, a cork factory and a brewery, all of them containing flammable material. 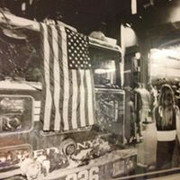 "The first alarm came from Box 36 at Bridge and Plymouth Streets at 12:31 in the morning. The fourth alarm was sounded at 12:37 followed by a general alarm at 12:39 and a special call for five more engines at 1:08 and another special call for three more engines at 1:19. First arriving companies found fire throughout the five-story building. The fire had spread to a cork factory next door. 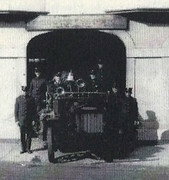 Water Tower 6 was placed in front of the building under the direction of Chief Thomas S. Coppinger, Chief of the 23rd District (now Battalion 33). 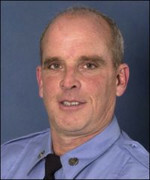 Chief Coppinger, age forty-two, was assigned to Water Tower 6 earlier in his career. Only operating for less than thirty minutes, the front wall bulged out and fell without warning. The wall destroyed the Water Tower and the men standing on it. 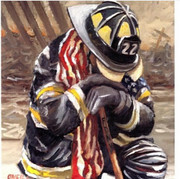 Chief Coppinger was still breathing when pulled out from the rubble only to die on the way to the hospital. 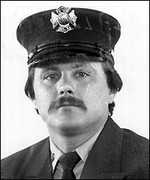 Assistant Foreman William Jeffrey, age fifty-four of Engine 126 (now Engine 226) who was detailed to Water Tower 6 and Fireman Michael J. O'Toole, age twenty-four of Ladder 55 (now Ladder 105), were killed instantly in the collapse. The fire was brought under control by 3:00 o'clock. FF David Derubbio died heroically in the line of duty while helping others at the World Trade Center on September 11, 2001. FF Brian McAleese died heroically in the line of duty while helping others at the World Trade Center on September 11, 2001. 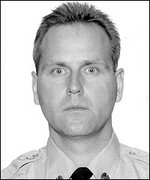 FF Stanley Smagala died heroically in the line of duty while helping others at the World Trade Center on September 11, 2001. 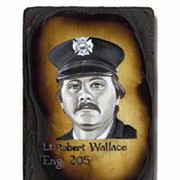 LT Robert F. Wallace died heroically in the line of duty while helping others at the World Trade Center on September 11, 2001. Boerum Hill, Brooklyn, circa early 1900's. The cobblestone streets wind their way through an immigrant rich densely packed community. Everybody knows everyone else. The houses are large and spacious. Their trademark brown facade gave them their name: brownstones. Boerum Hill, circa 1960's. The neighborhood is in decline. Racial tensions are beginning to erupt. Crime is on the rise and the phenomenon known as "white flight" has begun. The once distinguished brownstones are now graffiti covered. They go vacant, unrepaired, neglected. Boerum Hill, circa 1970's. 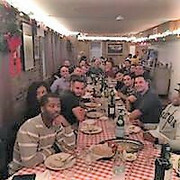 In an effort to restore life to the once tight knit community, Brooklyn Union Gas (the local gas utility) sponsors "The Cinderella Project". They, along with other private interests provide low interest loans to anyone who will buy and or restore the brownstones. Boerum Hill, present day. The neighborhood is alive. The once eyesores of the area are now beautiful examples of a long lost architecture. The sense of community has returned. However, the same organization that helped revitalize the area may now be responsible for the destruction of two of those refurbished homes. 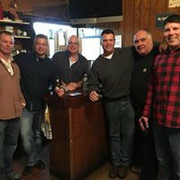 The members of engine company 226, located at 409 State Street, were going about their normal business in quarters when an explosion rocked the firehouse. As the housewatch called in the verbal alarm, members on foot raced up the block to the source. At first, it was hard to see what had happened as dust and smoke clouded the street. Moments later they were faced with a monumental task. A 4-story brownstone located at 420 State Street had been reduced to a pile of bricks and debris about 20 feet high. 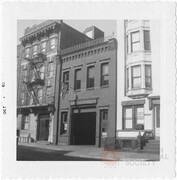 The adjoining house, 418 State Street, suffered a collapse but remained intact. Thus began a rescue operation that continues even as I write this 25 hours after the fact. By 1950 hours, units from all parts of the city began screaming to the scene. Rescue 3 with the collapse unit from The Bronx, Haz-Mat 1 and Rescue 4 from Queens, Tac-1 and the SOC Battalion from Roosevelt Island, and host of other units. EMS prepared for a mass casualty incident (MCI) and the FDNY Mobile Command Post raced to the scene. Initial reports indicated that five people were unaccounted for. The search was on. Within the first minutes, fire fighters located two of the residents in the rear of the building. They were fortunate enough to have escaped life-threatening injuries. The EMT's and Paramedics of EMS quickly stabilized them and transported them to a nearby hospital. But where were the other three? Piece by broken piece the building had to be searched. More manpower was going to be needed. Second, third, and fourth alarms soon followed. As Rescue 3 shored up the remaining structure other city agencies began to help. The NYC Office of Emergency Management arranged for heavy equipment. Sanitation brought in dump trucks to haul away the debris. Environmental Protection turned off water mains to the affected buildings. Consolidated Edison cut power. 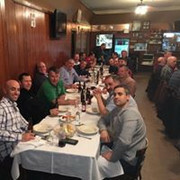 The NYPD K9 unit assisted in sniffing out survivors, and Keyspan Energy Corporation (now the parent company to Brooklyn Union Gas) checked the gas mains. Residents of the block had complained earlier in the week of a gas odor in the area. No source was found. 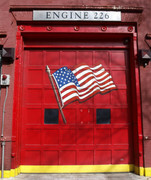 As members from engine 226 raced down the block, they noticed a heavy gas odor lingering in the air. When Keyspan arrived they conducted a preliminary investigation from the exterior and said no conclusions could be reached at this time. Obviously as the building fell the gas pipes would have broken thus causing the gas odor. With their current information, there is no way to tell if the gas odor was the cause of the explosion, or an effect of it. The final analysis of the gas service would have to wait until the conclusion of the search and rescue operation. The search continued through the night. Every 3 hours fresh units were brought in to replace exhausted members. Early the next morning rescuers found an elderly resident beneath the rubble but it was too late. Several hours later another resident was found, but as before it was too late. They were beneath tons of debris. The search continues for one more. Residents of the normally quiet block are now holding a vigil for the last resident. There is nothing they can do but hope against hope that some miracle will occur. 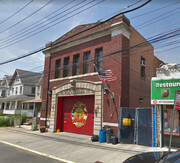 Engine 157/Ladder 80 firehouses 1573 Castleton Avenue Port Richmond, Staten Island Division 8, Battalion 22 "Cougar Country"
Captain James T. Lynch, Ladder 80, received the 1940 Stephenson Medal for best disciplined company in 1939. A 36-year-old Staten Island fireman who had received three commendations for valor suffered a fatal heart attack yesterday shortly after rescuing a young man from an early morning blaze. The fireman, Dennis Michael Peterson of Ladder Company 80, was stricken while fighting the blaze alongside his father, Daniel Peterson, a fireman with Ladder Company 83. 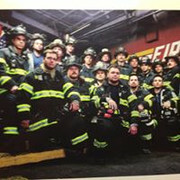 Fireman Peterson was the first New York City firefighter this year to lose his life in the line of duty. 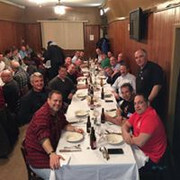 The last city fireman to die while fighting a fire was Battalion Chief Frank Tutlemondo, who pushed a fellow fireman, Lieut. Michael Ramos, away from a collapsing wall during a Brooklyn fire in August 1980. The fire yesterday - in a two-story building at 176 Van Pelt Avenue in Mariner's Harbor, S.I. - broke out about 1:30 A.M. Members of Ladder Company 80 arrived to find the first and second floors in the small, two-family house ablaze. Firefighters could not enter the building through the front door but Fahmy Saad, a resident of the building who was able to escape with his wife and the couple who lived on the first floor, told the firemen that his two sons were still trapped in the second-floor apartment. The firefighters went to the back of the building and Fireman Peterson, who was the first man up the ladder, was able to bring one son, 22-year-old Mountier Saad, out. Meanwhile, members of Ladder Company 86, which also responded to the alarm, rescued Mr. Saad's other son, 9-year-old Maher. The fire was brought under control just after 2 A.M.
Fireman Peterson had returned to the building to assist in the cleanup operation when he began gasping for air. He struggled to a window and the company's chief, Lieut. George Harrison, grabbed him to keep him from falling. Lieutenant Harrison gave him mouth-to-mouth resuscitation and heart massage, but the fireman lost consciousness. He was taken to St. Vincent's Hospital on Staten Island, where he died at about 3:30 A.M.
Maher Saad was taken first to St. Vincent's Hospital and then transported to New York Hospital-Cornell Medical Center by a Coast Guard helicopter that landed in Central Park early this morning. Mountier Saad was taken to Staten Island Hospital and later transferred to the same Manhattan hospital. Both victims are listed in critical condition with severe burns. The most recent of the three decorations received by Fireman Peterson, a 13-year member of the force, came last July for his assistance in foiling a robbery at a Staten Island bank. While stopped at a traffic light he noticed a man leaving a Chase Manhattan Bank branch on Forrest Avenue carrying what turned out to be a decoy money satchel trailing red smoke. Mr. Peterson left his automobile and chased the suspect, who was able to jump into a waiting car. The police were able to find the suspects after the fireman gave them the license number of the vehicle. In July 1979, Mr. Peterson rescued two children caught between two high-tension wires. In June 1971 he used mouth-to-mouth resuscitation in a futile effort to save a 73-year-old woman who had suffered a heart attack. 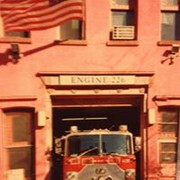 Mr. Peterson began his career with the department with Engine Company 279 in Brooklyn. In March 1980 he joined Ladder Company 80. 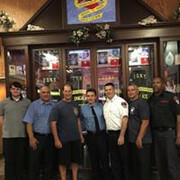 Mr. Peterson's brother, John, is a firefighter with Ladder Company 105 in Brooklyn. The fireman, who lived at 3 Stebbins Avenue in New West Brighton, S.I., is survived by his wife, Gail, and two daughters, Laura, 11, and Denise, 9. A funeral mass will be offered at 11 A.M. Tuesday at Sacred Heart Roman Catholic Church, at 981 Castleton Avenue in New West Brighton. Burial will follow at St. Peter's Cemetery. 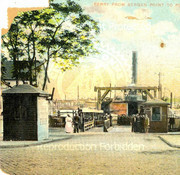 Port Richmond SI was location of a ferry to Bayonne NJ - the Bergen Point Ferry - from 1876-1962. Earlier versions of the Bergen Point Ferry operated as early as 1750. Port Richmond was also home of Weissglass Speedway - home of weekly stock car racing.